So the next steps were fairly straight-forward, I now needed to paint all the extra panels red. It was fairly easy to identify which panels to do, as they stood out from the rest of the larger panels. For these I used Golden Acrylics, for the basecoat I used C.P. 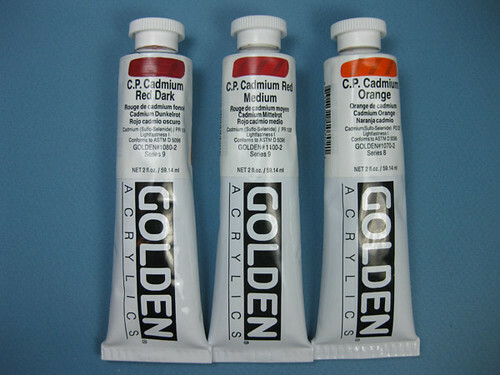 Cadmium Dark Red. 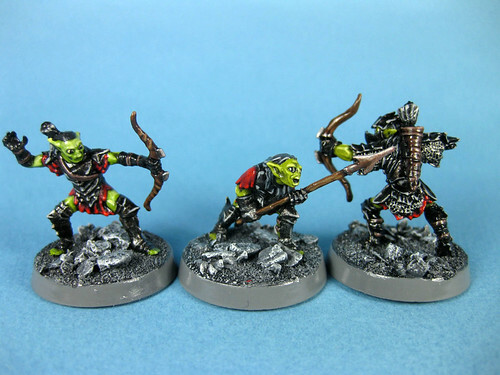 I have recently been using quite a number of different products from the local art store, the store is much closer than my nearest GW store, and the prices are unbeatable when compared to GW paints. I will put a post at some point about the different products I am playing around with. 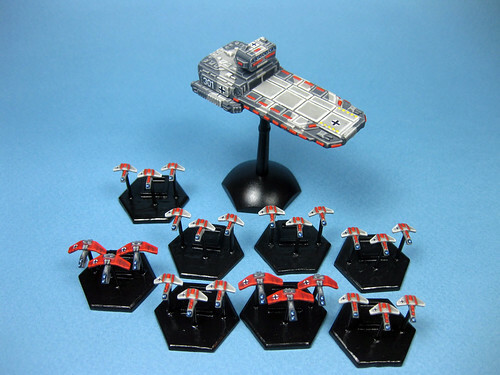 So for this fleet it is just the red paints. So, back to the ships. The difficult part, well actually more time consuming than anything, was getting the sides of each panel. 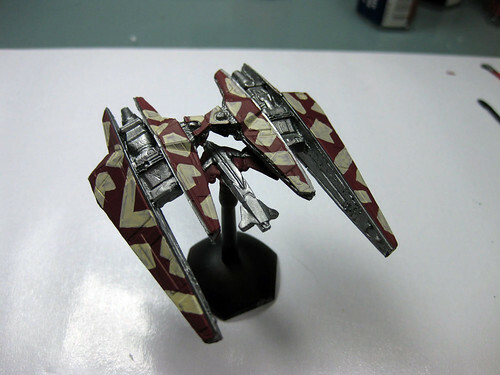 The panels probably average about a millimeter thick, so the sides of each are not too easy to paint. However, it makes a real difference when you look at the ships up close. The photo below is a good example of what I am talking about. I also found that when I was painting the top of the panels I would go over the edge a little anyway, and then they looked quite messy and inconsistent. So this one really was just patience, the trick was to get your brush onto the top of panel and then just roll it down the side at the same time as drawing the brush along the side. 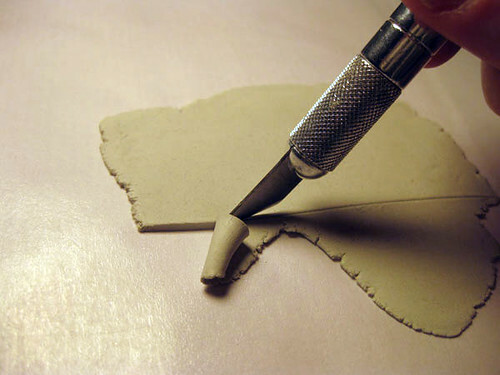 In this manner you are painting with the side of the brush not the tip. You will notice that I wasn’t perfect, not an issues as the small mistakes will be covered with the wash, and the bigger ones can be fixed with the original paint. So after many hours of using very small brushes and almost going blind… I also did all the windows at the same time, in the same manner, but using black. Next was the wash, very diluted black paint with some acrylic medium, and a drop of future floor polish. Here are before and after photos. 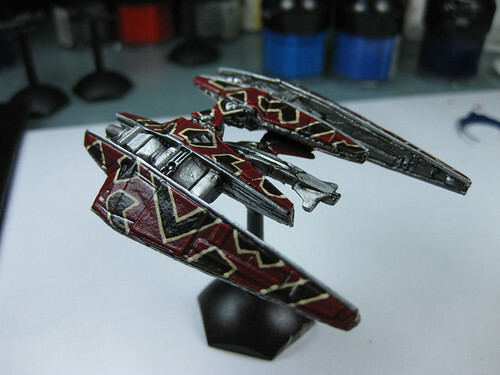 To be honest I wish I had made the wash darker, I think these ships, espeically the smaller ones would have benefited from more of a contrast. Next came the highlighting. This stage took forever, I highlighted each panel twice! 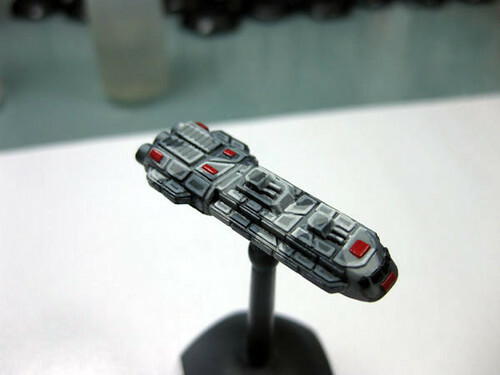 The first highlight was the base colour lightened a little, so for the dark grey I added a little of the light grey, and the second highlight had more of the lighter colour. I also used a good amount of acrylic medium, this starts to make the paint a little translucent, which can help with getting everything to work together. 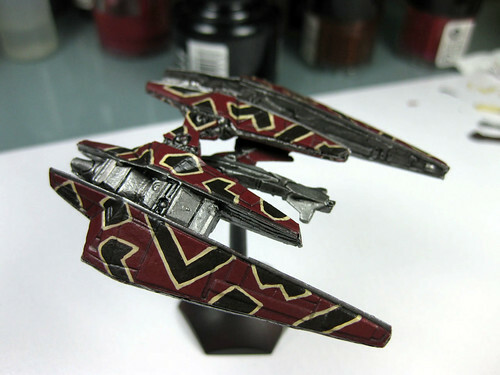 When I first started I had a hell of a time painting with the Tamiya paints, they were totally different from anything I had used before. Even though they are acrylic, they are solvent/thinner based, and the thinner evaporated so fast some times the paint on the end of the brush would dry before I even got it to the model. Adding water and additional thinner would just make the pigments clump and make a big mess. 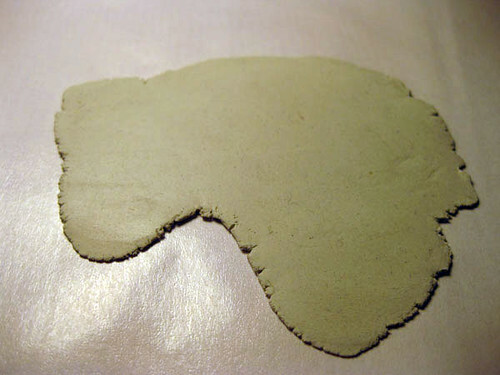 The eventual solution was the arcylic matte medium, which is basically arcylic paint without pigment. I would add quite a bit of it to just a few drops of the Tamiya paint, and add a drop of water or two to make it flow better. 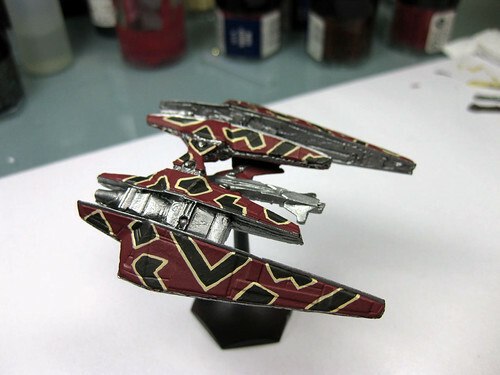 The end result was much closer to the types of paint I usually use, Citadel or Vallejo. And after the first highlighting, so the next layer would be brighter and the lines would be thinner. 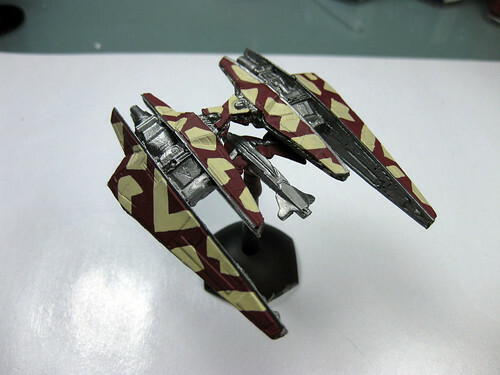 By making the second highlight thinner it give the effect of a bit of a fade at the edges of the panels. The same process was used for all the red panels, with the final highlight using a little bit of orange, to avoid it looking pink. 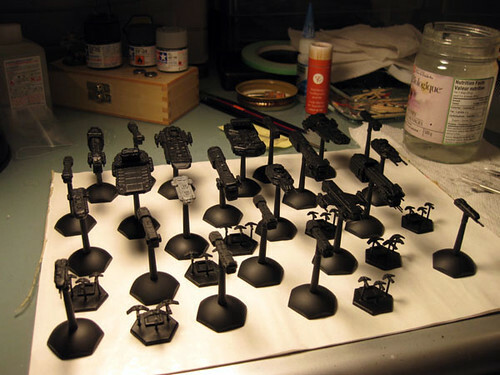 Once all the highlighting was done, I gave all the ships a gloss coat to seal them and prep them for the decals. I bought a whole bunch of different scale decals, 1/72, 1/144, and 1/285, as I didn’t know how they would look until I had them in my hand. I bought most from I-94 Enterprises and Dom’s Decals. So I applied many many decals using Micro Set and Micro Sol decal setting solutions, these are used to get the decals to look painted on. I must say I really like the looks of the numbers, it really gives the fleet a feeling of cohesion, and makes you think there might be a lot more ships out there filling in the rest of the number series. Nearing the end now, I did the jeweling on the windows and painted the engines. Next they got two more thin coats of gloss coat, and then a final two thin coats of dull/matte coat. And then they were finally finished. Now I will just add some gratuitous close ups, they should help you see all the different highlights. For more check out my flickr page. 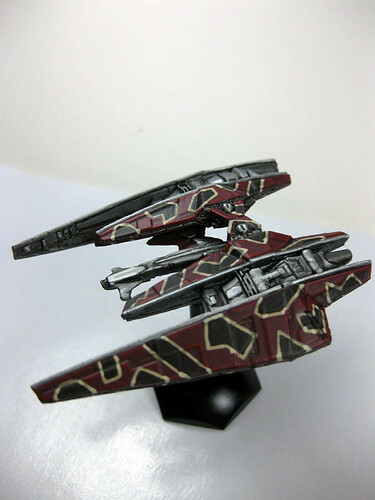 I thought I would share how I painted these ships. 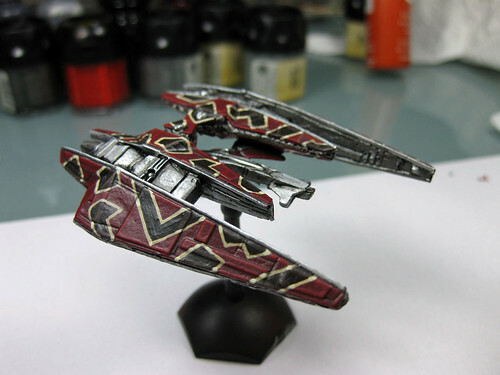 I borrowed the technique used to create the two tone paint job from the scale model community, and it works really well on this scale as well. 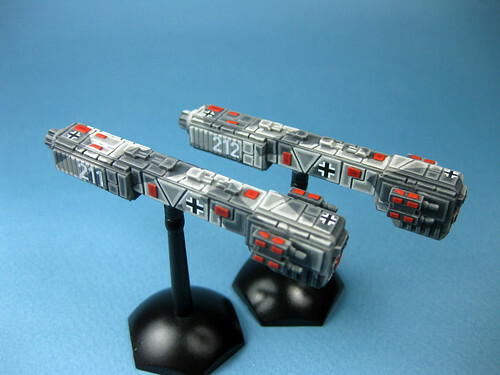 To be honest when I was planning how to paint these little guys I was originally planning to try a WWI ‘Dazzle’ scheme that was used on naval vessels. However after doing some research I realized it would be too difficult and time consuming, I still think it could be pulled off but it woudl need ships that have smoother hulls. So I decided to try a two tone camo. 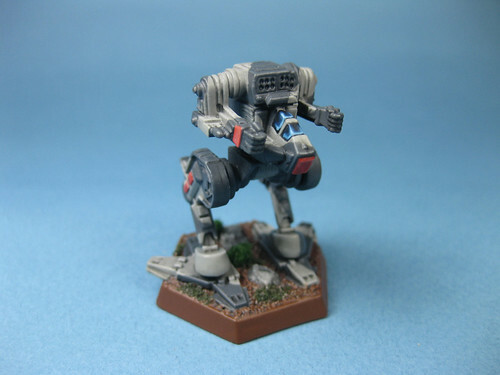 One of the things I have started doing that I find really handy is to do a test mini, in this case I used a Battletech miniature. Doing this can help me identify anything that might be a problem, but more importantly give me a better idea of how the whole fleet will look when finished, below is the test mech. 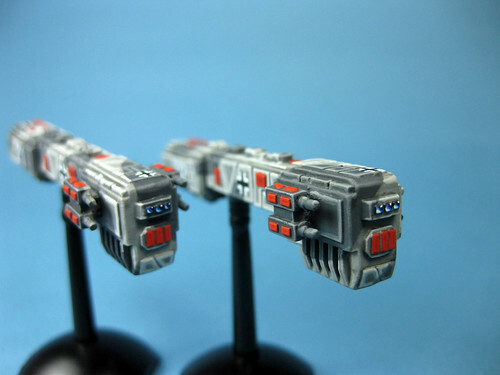 I used Tamiya paint for these, as it works really well in my airbrush. 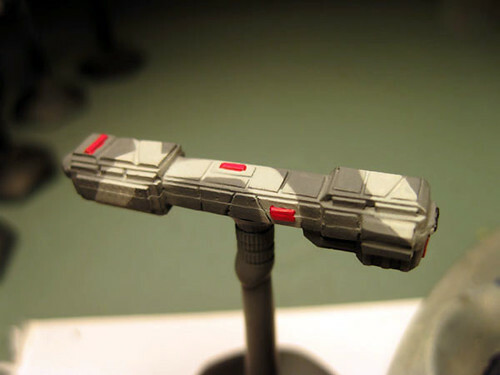 My airbrush doesn’t get much use on miniatures, but it is great for base coating. 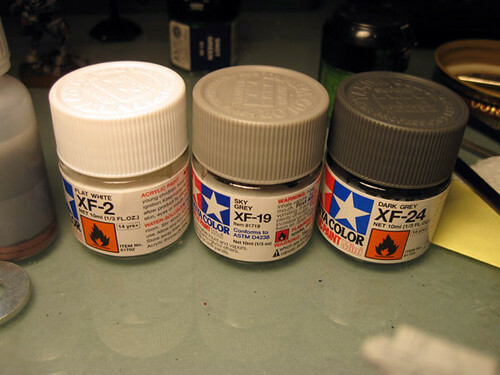 If you don’t have one you can always use Tamiya spray cans, just be careful as they spray a lot of paint. 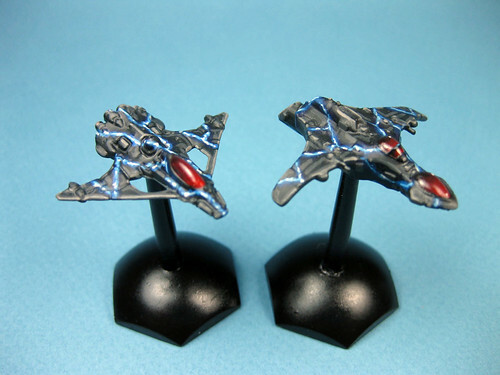 So here are the colours, quite basic just Sky Grey and Dark Grey, the white is just for the highlighting. 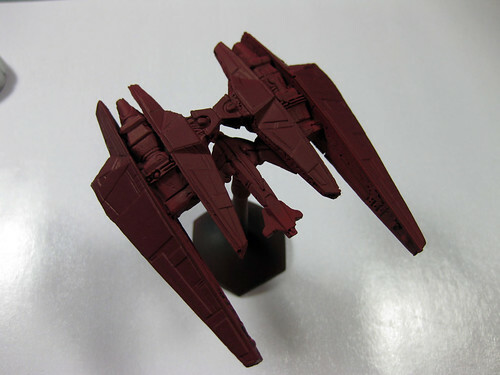 So the ships are first primed black using an automotive primer, I use this as it works just as well as anything else I have found and it is cheap. 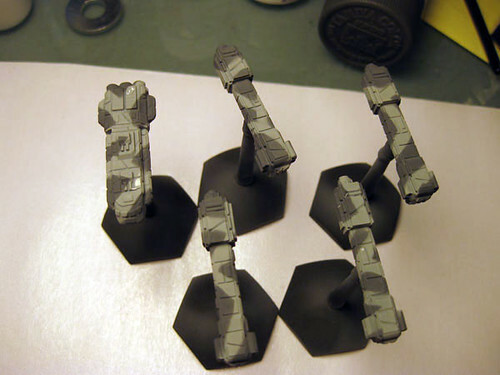 Next they are basecoated in the Sky Grey, two thin coats, don’t want to cover the detail. I start with the lighter of the two, as I want to be able to do the next coat in one go, so the dark should cover the light easier. 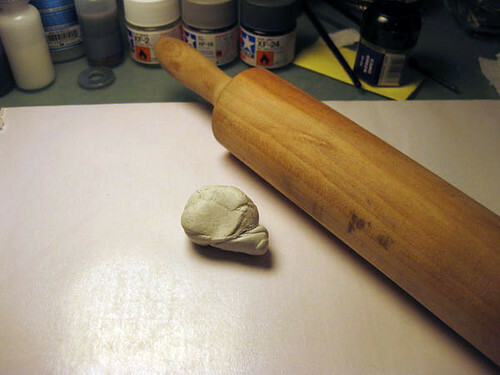 Then comes the neat part, using BlueTac, used for hanging posters and things, we apply a pattern. Now you need to take care that you push the bluetack down very well, or else paint will get under and spoil the job, see below. Don’t forget to do the bottom as well, this needs a little thought on how and where the strips will meet up. Alright, here they are all ready to have the next colour sprayed on. So into the spray booth, and on goes the Dark Grey. 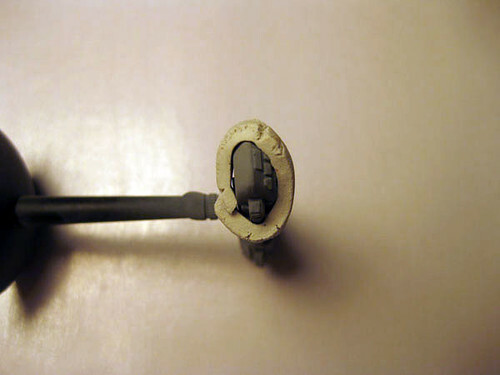 Now we just peel off the bluetack, just use your fingers you don’t want to scratch the paint. 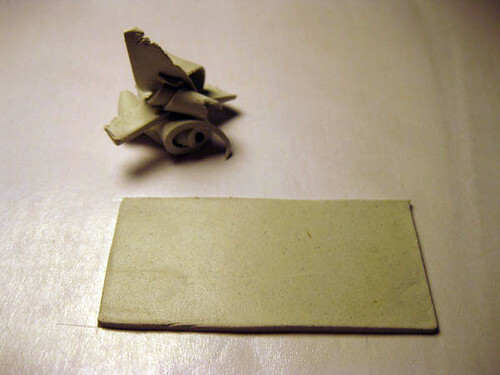 Don’t worry about little bits sticking, they are easily removed by neading some bluetack until it is soft and then repeatedly pressing it onto the remaining pieces and pulling it off again. Just keep doing it and eventually it will all come off. You can see some of it still stuck on mine below. Alright there is step one all done, the whole fleet ready to move on. I will cover the next steps in a follow-up post. 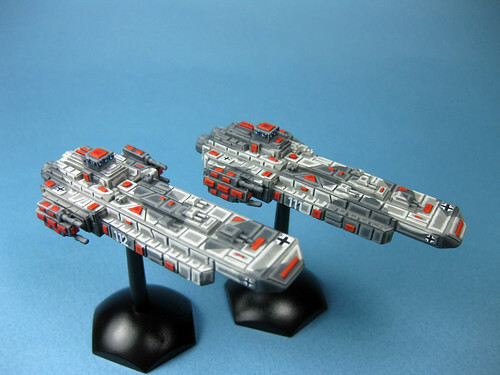 Just put the finishing touches on these ships today. This fleet has taken me a very long time to finish. 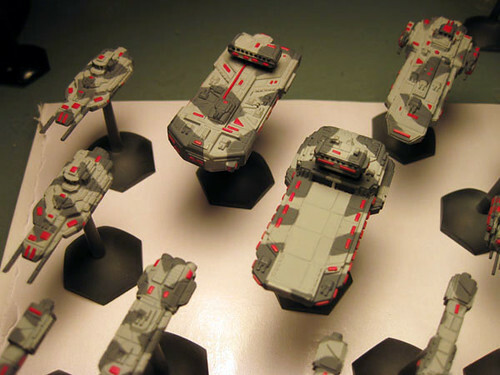 While I was going through my photos of this fleet, I found some work-in-progess photos that date back to June of 2010. So a year and almost a half, now to be honest I put these away on the shelf a number of times. The highlighting of every little panel just got the better of me too many times, and I would leave this project for a while and work on something else. And of course anytime a new purchase showed up it would get all the attention, for a few days at least. So like usual I have tonnes of photos of these guys, I will have to show some restraint in posting too many. A big family shot to start us off. These are all from Bridage Models, and are German or as they call it ONESS. I can’t find any reference as to what that actually stands for. EDIT: Thanks to Aapsych20 on The Miniatures Page I now know that it stands for the Organisation of North European Sovereign States. Now the Carrier and her Fighters. 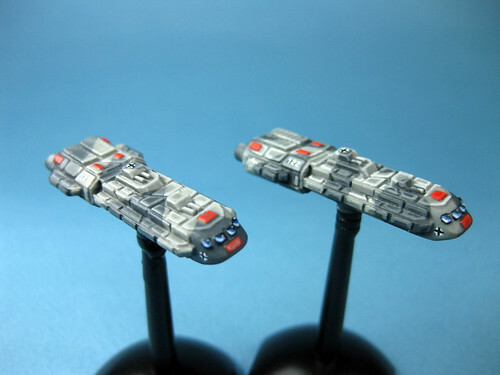 Next the smaller ships, Destroyers and Frigates. 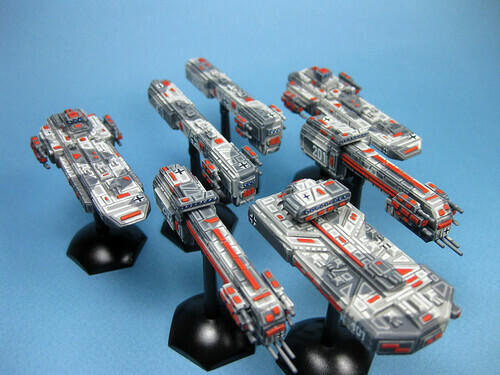 And then all the Capital Ships. Not to show too much bias, but that last shot is my favorite. 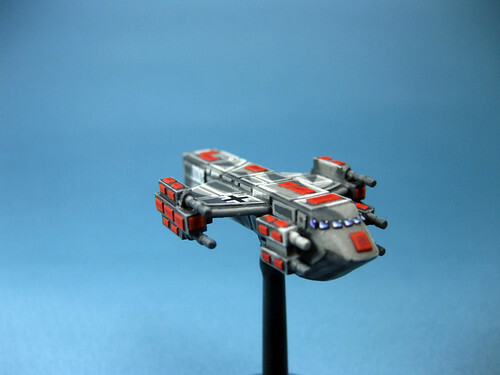 Well that is a start, I have a number of posts that will follow; more detailed photos of each ship type, and some tutorials. Hope you like them. Feel free to add a comment. 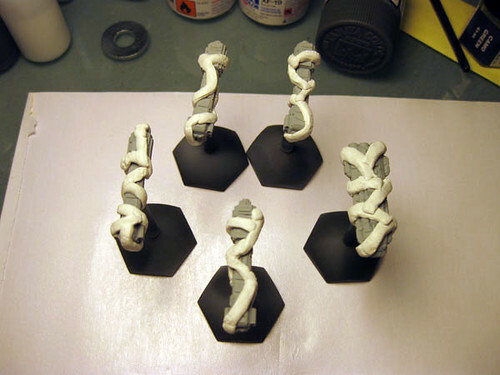 The bases for these were pretty straight forward, just kitty litter as the rocks and sand for the rest of the ground. 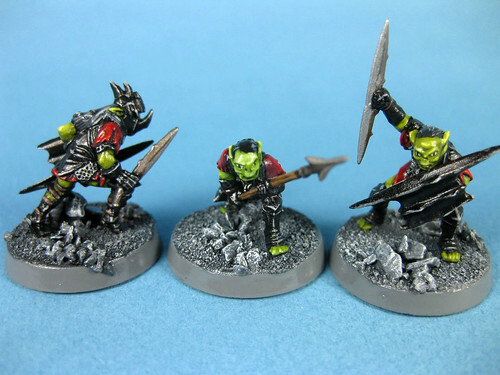 I decided that I would paint the bases before doing the model, mainly to avoid getting paint on the finished mini. So the whole mini was first primed black with automotive primer, and then using my airbrush I painted the bases Codex Grey, this was followed by a heavy black wash. Then successive highlights with Codex Grey, Fortress Grey and White. 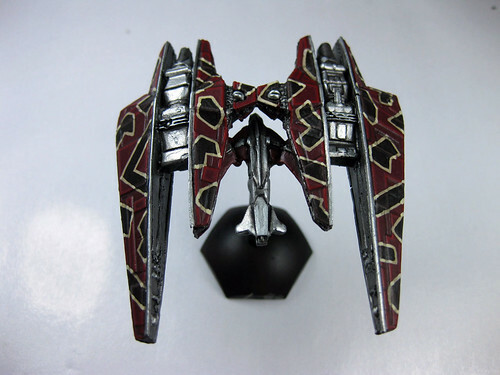 I then repainted the mini black to cover all the paint that got on them. 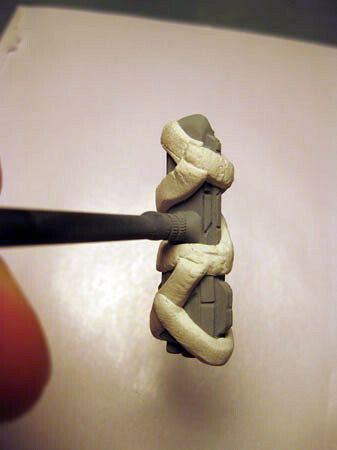 This process worked really well, trying to do that much dry brushing around a finished mini would have driven me crazy. I chose four different colours for the skin. I acutally bought about ten different colours and then using a large pad tried them all out to see which I liked best. 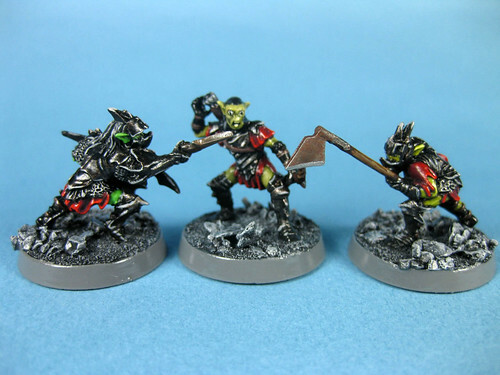 I chose Goblin Green and Camo Green from GW and Olive Green and Yellow Green from Vallejo, all of them were lightened with Bleached Bone for the highlights. The reds were done with Games Workshop reds, and the last highlight got a touch of a Golden Acrylics Orange, so that it didn’t look too pink. Just finished these within the last few days, and am now finally getting them up online. Had a bit of a scare, after I took the photos and was uploading them to the computer I couldn’t find any of my previous photos. Took me a while to realize that I was missing an entire harddrive. After performing a few tests I just opened up my case, and the power lead had come a little loose. Of course until I actually got it up and running again I was very worried that the drive had died, and I would have lost everything on it. Lucky me it was an easy fix. I have had these guys sitting on a shelf for ever. 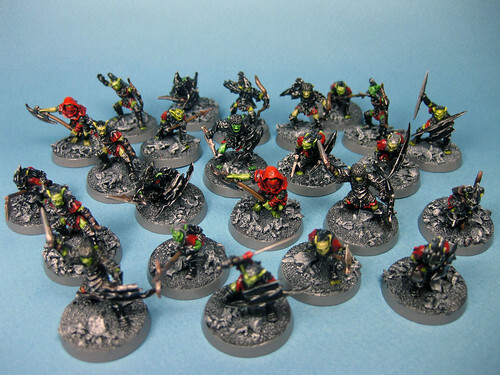 I bought the first Games Workshop box set for the Fellowship of the Ring, which included 24 goblins (I think), and over the years I picked up an additional box of 24, a number of Prowlers, Durbuz, some shamans, and some of the metal normal goblins off of eBay. 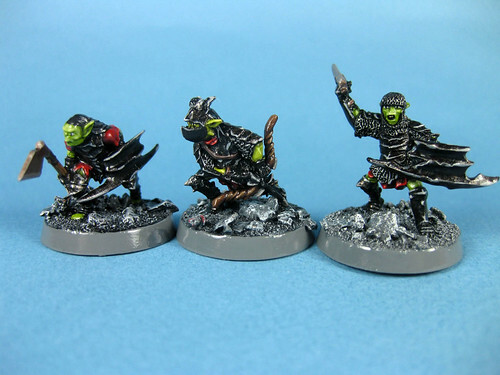 All told I have 80 goblins. 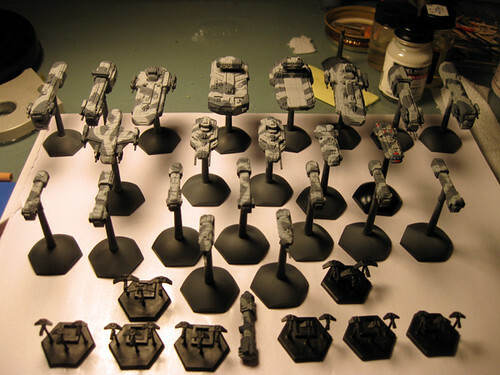 I am a fan of doing things in batches so all 80 were cleaned up, based, primed, and had the bases base-coated at once. 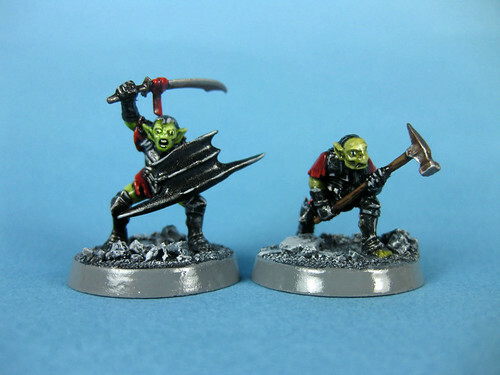 I also made the decision to alter them a little, as I had 48 plastic generic goblins, that repeated the same pose and weapons more often than I would like. I only cut up a few, the vast majority got weapon swaps, almost all of the weapons came from Thunderbolt Mountain. Between the different ranges on their site there is a really good selection of weapons. 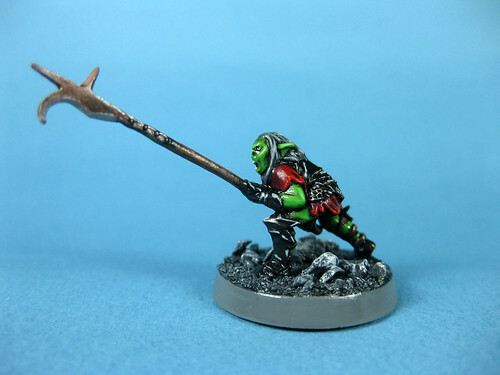 I figured the goblins had either made a few different weapons, or most likely stole them from dead foes. 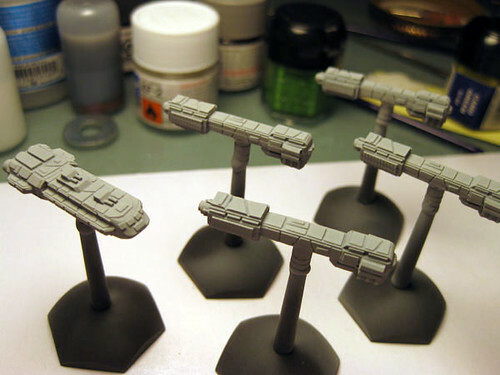 I recently ordered a batch of small dice (6mm) and flying bases from EM4 Miniatures, and while I was there I decided to grab a set of their generic “Spacecraft”. 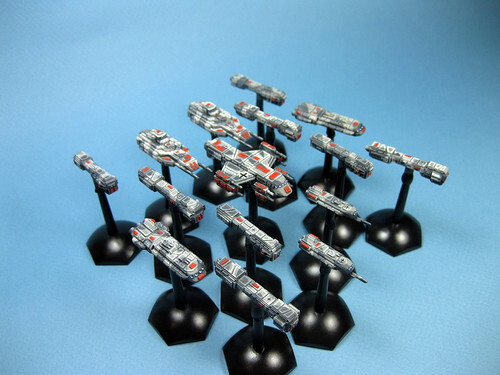 You get twelve different gray plastic ships and accompanying bases all for 2.55 pound, or $4 Canadian. I just got them on a whim, I had heard a few people recommend them in different forums but hadn’t thought too much about them. When they arrived, which was pretty quick considering they were coming across the Atlantic, I was thoroughly surprised. 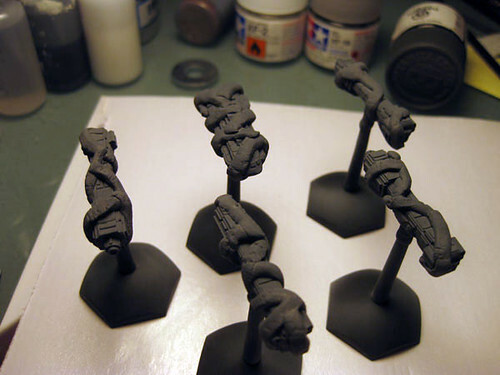 They are great, very nice sculpts, no flash to clean up, and some fairly small mold lines to scrape off. 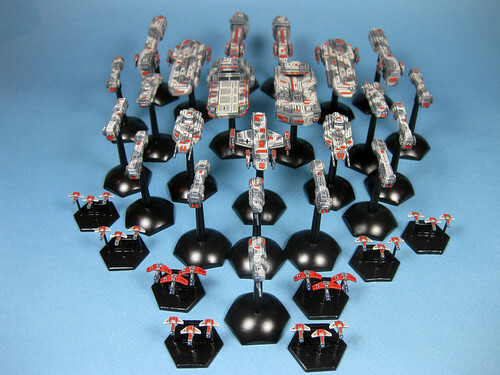 I had them cleaned, based, and primed in a day or two. I tried a number of new things with these two. First was painting them just black, they turned out okay, but I had a horrible time trying to highlight them. Second was the lightning, I had a great time doing it. 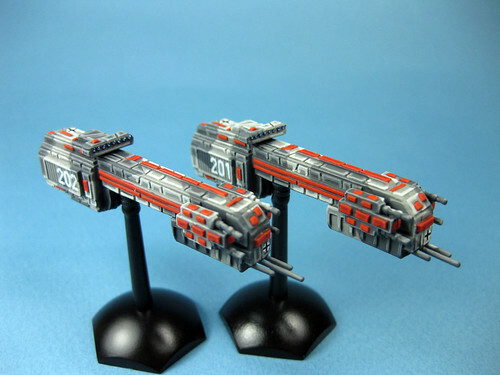 The first ship I did is the one on the right with the skinnier bolts. I prefer the look of that one up close, but from a few feet the thicker bolts look better. 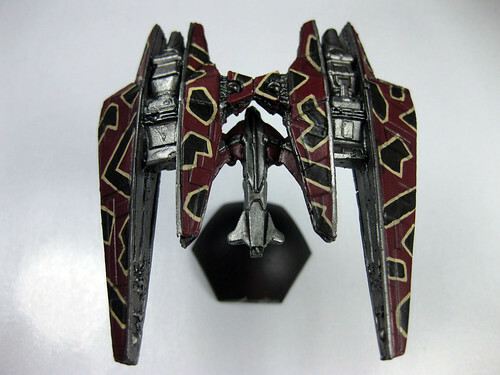 The third was the fade/blend on the cockpit glass. 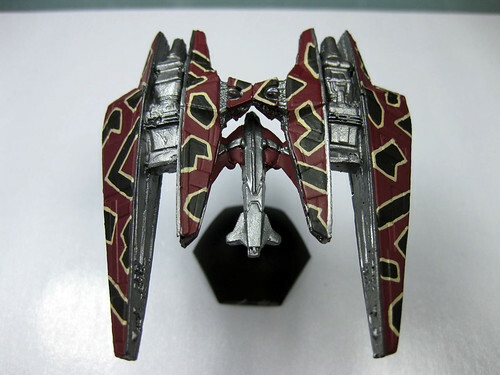 I usually use the jewel technique for windows, but decided that these ships needed something a little flashier to go with the overall paint job, the picture doesn’t do the cockpits justice. I also tried doing a different colour on the engines, usually I do a blue to white transition, but this time I tried an orange to white. I definitely didn’t have the right shade of orange, and it didn’t turn out as I had hoped. I had one other thing go, well not quite wrong, but not good either. 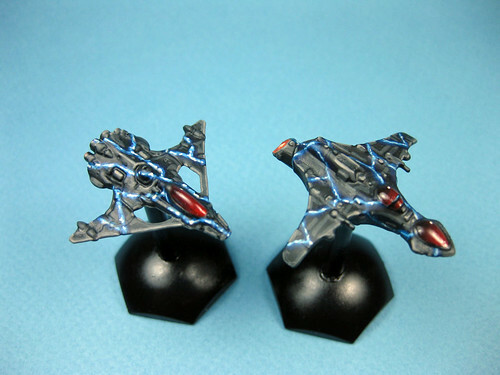 When I am done painting the miniatures I give them a couple coats of high gloss spray varnish to protect them, and then a last coat of matte varnish to finish them off. I will admit that I am paranoid of the paint getting chipped or rubbed off, so I can over do it with the gloss varnish, and I definitely went way overboard this time. It kind of shows in the photos, the panel lines are basically gone, I filled them with varnish, obscuring a lot of detail. On the next pair I think I will try brushing the gloss varnish on by hand and see what I can do. It will take a longer time, but I should be able to control the amount a lot better, the big question is whether or not I can avoid brush strokes. 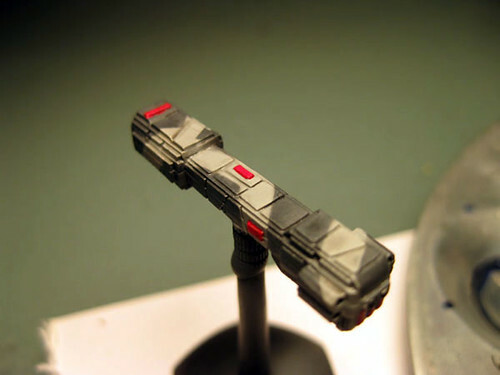 So this post should wrap up the walk-through on this ship, only the highlighting and finishing touches left. I highlighted the Bleached Bone first, I added a little White, and an equal amount of Matte Medium, and a little water. 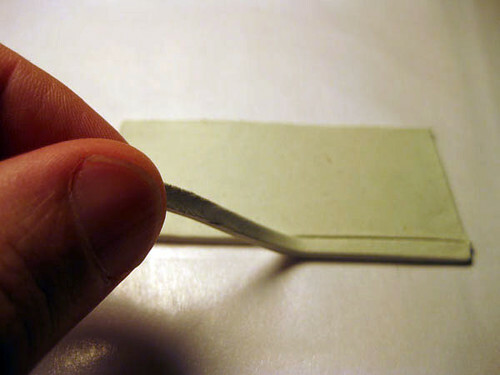 The Matte Medium, is basically paint without the pigment, by adding it to the mix my paint becomes slightly translucent. This way each highlight just blends into the previous coat a little. I made the Bleached Bone highlight a little too bright, and ended up putting it on too much in a couple of places, so I only did the one layer of highlight. Next was the Scorched Brown, same mix to the paint, and this time on the second highlight I added a little Bleached Bone and just did the very edges. Next was the reds, I started with Red Gore, and then added some Blood Red for the second highlight. I then did the metal parts, using Chainmail for most of the highlights, and then just picking out the very edges and highest points with Mithril Silver. 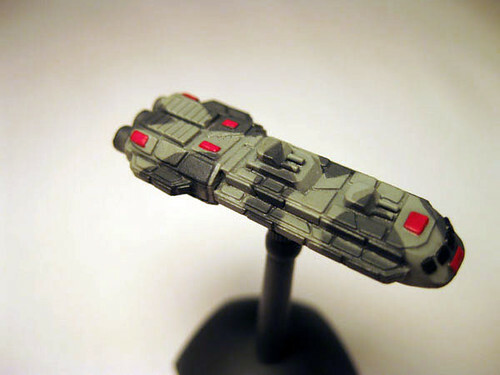 At this stage the painting of the ship was finished, and it went into my spraybooth for a few coats of gloss varnish. After the first coat I noticed that I forgot to paint the engines, so I quickly painted a blue to white transition, and with the aid of the hair dryer, I had it back in the spraybooth in a few minutes. Once the gloss coats had a good amount of time to dry, I then added two coats of matte varnish. I am always amazed at the change adding the matte varnish makes to the paint job, up until this point the highlights were looking a little garish, but as soon as I hit it with the matte varnish everything chilled out nicely. 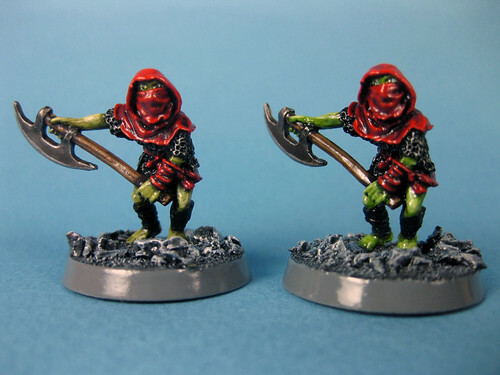 Below you can see the difference, the first photo is just the gloss, and the second is the matte. 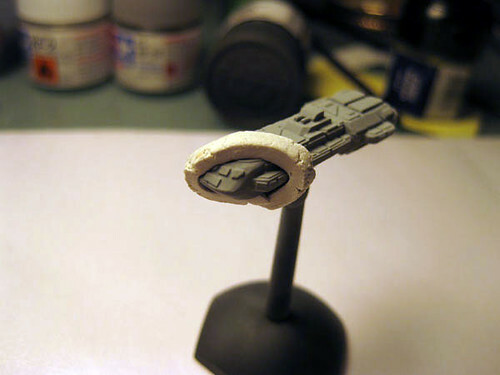 The big benefit of the type of basing I do, is being able to remove the base once the ship is done and repaint it. Through out the process I had been getting overspray and errant brush strokes all over it. I just pop the mini off, secure a barrel clasp to the top to protect the threads, and quickly re-prime it black, and then give it a gloss coat. 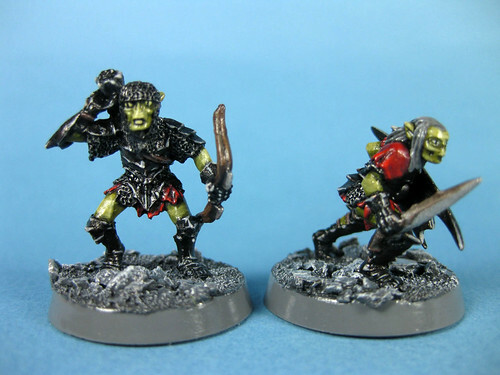 For whatever reason I prefer for the mini to be matte and the base to be gloss, and that is a really easy way to accomplish it. 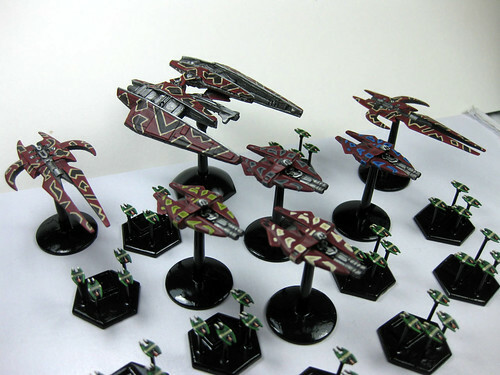 And one last group shot of some of my other finished Narn ships to end this walk-through. I hope you found this at least entertaining if not informative. Now on to my next project, which should make its way up here soon.